Okay since I am having trouble writing about ONE particular restaurant/bakery/eatery, I figure this entry can be about a myriad of places that have one common trait: tasty food. I will name some “must-haves” when in New York, though this definitely is not a complete list whatsoever. What is this, you ask? 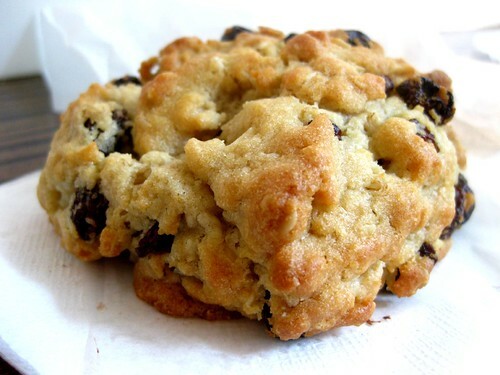 Let me introduce to you the oatmeal raisin cookie from Levain Bakery. Trust me, it is as good as it looks. How many calories? WHO KNOWS, but who really cares? Once the buttery goodness enters your mouth, you will feel like all is well just like the Oracle said to Neo in The Matrix, “I promise by the time you’re done eating it, you’ll feel as right as rain“. Can we say saaandwich? This is the Michigan #6 from Grey Dog Coffee. I love the thick bread combined with layers of grilled chicken, fresh mozzarella, pesto, and roasted tomato. 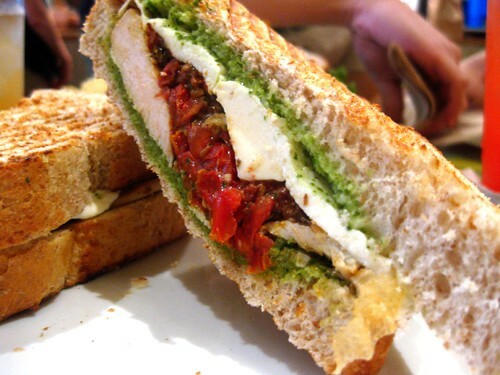 There is a perfect ratio of ingredients to bread, which is VERY important when it comes to having a good sandwich. As you chomp down on the sandwich, you first notice the lightly toasted yet soft bread. Then gradually hit the beefiness of the chicken and mozzarella. Lastly, the roasted tomato adds the silkiness and tartness of the sandwich. It is a voyage of great textures and tastes with every bite. Definitely two thumbs up! A simple dessert but oh-so-tasty – Greek-style Yogurt with Honeyfrom Snack. I would say it is not just beautifully presented, but they allow you to put as much honey as you want to your Greek yogurt. I tend to add honey one spoonful at a time so I appreciate the option. A lot of restaurants put mounds of honey, but since you can adjust the amount at Snack, I am thoroughly satisfied with my Greek yogurt. 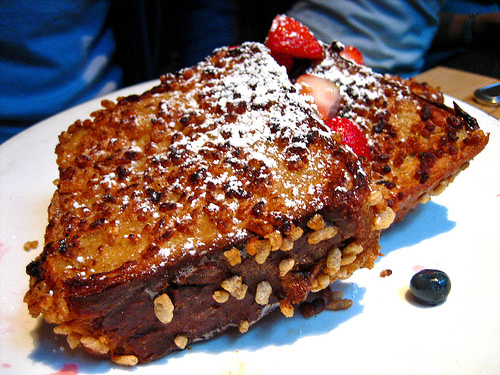 Lastly, I think this is just a funny looking piece of French toast…but hey, either way it’s edible right? 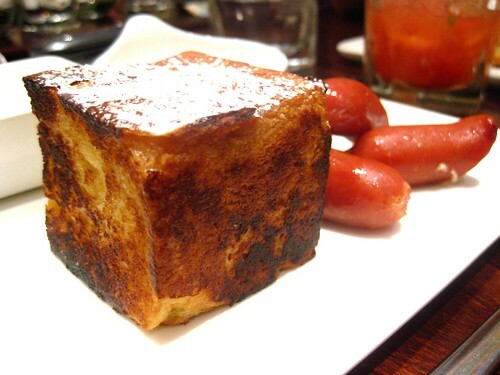 This is the Japanese-style Brioche French Toast from Kyotofu. It is served with served with coffee shochu syrup and a side of kurobuta Berkshire sausage. Even though it may look good, I actually don’t remember it being very memorable or delicious which is kind of sad and disappointing. 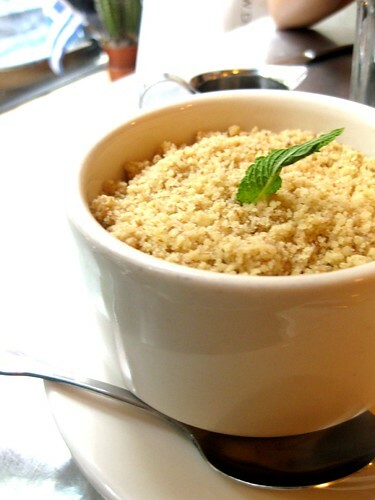 However, it is not too expensive and comes with a complimentary drink! Not to mention, how often do you see a cube-sized piece of French toast? Conclusion: None of these places are very expensive so it is affordable to the average person. Even more importantly, these restaurants provide the city some really great cheap eats.